Text TRAVEL16 to 95577 for more info or click here for full details! This is where fun lives! 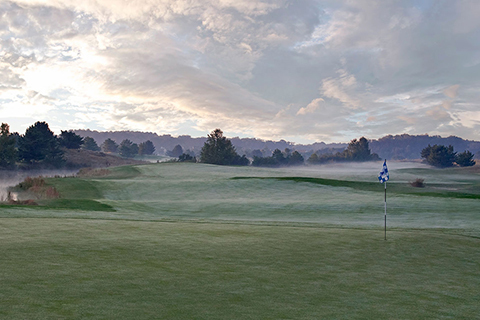 Bear Trap Dunes Golf Club offers one of the area’s most unique and memorable golf experiences on the Eastern Shore. Winding bentgrass fairways are lined with native wetland grasses that drift into stunning sand dunes on this natural golf course. Impeccably groomed oversized greens and four masterfully placed sets of tees beckon golfers of every skill level. Enjoy one free adult round of eighteen hole golf per unit, per paid night stay, with reservations made in advance. Reservation required. Noncumulative and nontransferable. Unused admissions expire daily. Neighboring the Delaware coast, Salted Vines Vineyard & Winery is warm and inviting with a rustic flare. We offer a wide variety of wines ranging from sweet to dry, so there’s something to fit everyone’s palate. Enjoy a taste of each wine we currently have on our menu and you may even find a new favorite. 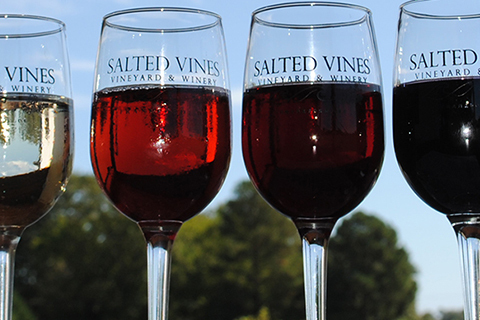 Visit us today for a taste of Salted Vines! Enjoy one free adult wine tasting admission per unit, per paid night stay, no reservation required. Noncumulative and nontransferable. Unused admissions expire daily. 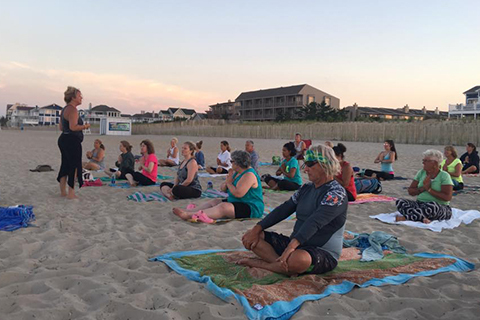 Dewey Beach Yoga offers fun Yoga Lessons that are great for all levels. Grab a towel and relax as our experienced instructors guide you through different poses. Bask in the sun, watch for dolphins and enjoy Dewey Beach. Enjoy one free adult eight AM beach yoga class per unit, per paid night stay, no reservation required. Noncumulative and nontransferable. Unused admissions expire daily. Escape Rehoboth is a fun, interactive game taking place here at the “Nation’s Summer Capital.” While it looks like an ordinary room, it’s much more. Find hidden objects, figure out clues, and solve puzzles to earn your freedom! 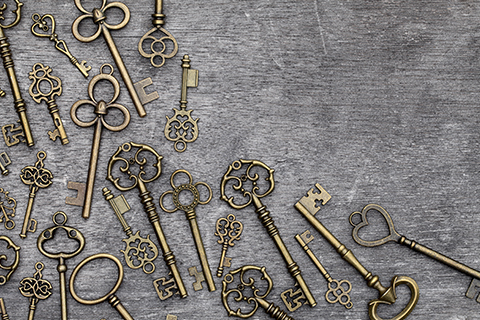 You have one hour to complete the room, so be quick! Come with your friends, family, and coworkers to have a great time. Jolly Roger® Amusement Parks Splash Mountain Water Park offers an unparalleled collection of water activities to enjoy, all under the watchful eyes of a fully trained and certified Water Safety Staff. 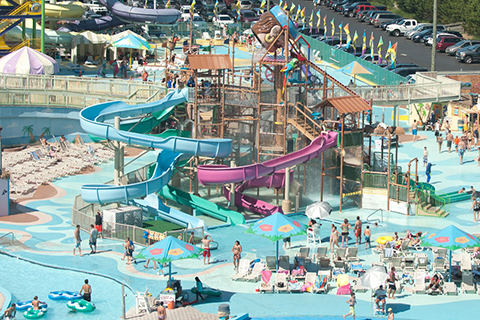 We're home to the Aqualoop, Lazy River, Stealth water slide, and kiddie pools just to name a few! Enjoy one free adult admission to Splash Mountain Water Park per unit, per paid night stay, with reservations made in advance. Reservation required. Noncumulative and nontransferable. Unused admissions expire daily. Seagreen Bicycle Rentals is home to a highly trained, professional staff ready to rent you a bicycle! We aim to provide the best gear possible so that you can enjoy cruising around this beautiful area with ease of mind. Cycle away the day with bicycle rentals from our locations in Rehoboth Beach and Lewes! 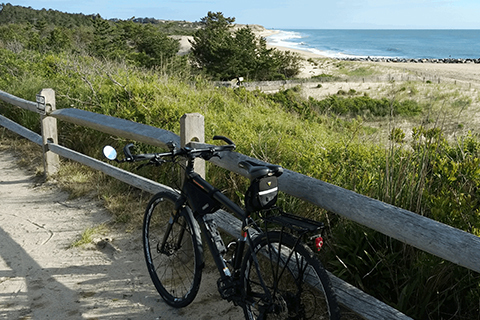 Enjoy one free adult full day bike rental, your choice of a Comfort Bike, Beach Cruiser, or Hybrid Fitness Bike per unit, per paid night stay, with reservations made in advance. Reservation required. Noncumulative and nontransferable. Unused admissions expire daily. 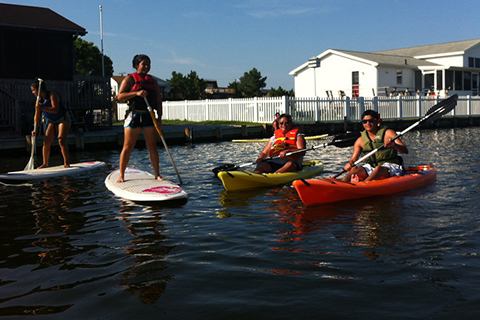 Whether this is your first time out or you are a seasoned board sports enthusiast, Delmarva Board Sport Adventures has a Stand Up Paddleboard or Kayak for you! Stop by today and get your paddle powered adventure started! Enjoy one free adult one hour Stand Up Paddleboard or Single Kayak rental per unit, per paid night stay, with reservations made in advance. Reservation required. Noncumulative and nontransferable. Unused admissions expire daily.